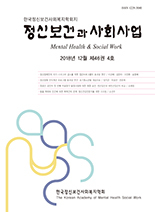 하민정, 박소연,(2015).청소년 도박중독 과정에 대한 연구.정신보건과 사회사업,43(3),220-249. 본 연구의 목적은 청소년기에 도박을 시작하여 중독에 이르렀고 성인이 된 후에도 도박을 하고 있는 13명의 연구참여자를 대상으로 청소년기에 시작한 도박이 어떤 과정을 거쳐 중독으로 이어지며 이로 인한 문제는 어떠한가를 탐색하는 것이다. 자료는 심층면담을 수행하여 구성하였고, 이를 근거로 원자료(raw data)를 만들었으며 이를 Strauss와 Corbin(1998)이 제시한 근거이론 연구방법 중 개방코딩, 축코딩, 선택코딩 순으로 분석하였다. 분석결과는 다음과 같다. 개방코딩에서는 108개의 개념, 35개의 하위범주, 15개의 범주를 구성했다. 축코딩에서는 15개의 범주를 논리적 다이어그램에 의거하여 패러다임 모형으로 제시했다. 인과적 조건은 ‘높은 접근성’, ‘수월한 도박관문 통과’, 맥락적 조건은 ‘일탈적 성취욕망’, ‘도박 예행연습’, ‘인지의 왜곡’, ‘미분리로 인한 혼돈’, 현상은 ‘도박환상’, 중재적 조건은 ‘도박의 고리에 묶여 살아가기’, ‘합법적으로 도박할 수 있는 연령이 됨’, ‘사회적 윤리의식의 희박’, ‘벽에 막힌 상담’, 작용/상호작용 전략은 ‘자기성 버리기’, ‘수단 불문하고 도박자금 마련하기’, 결과는 ‘요행수만 노리는 일탈적 삶’, ‘국외자로 살아가기’로 나타났다. 선택코딩에서는 핵심범주로 ‘자신을 옭아매는 도박의 덫에 걸려 살아가기’로 제시하고 이야기 서술을 했다. 마지막으로 연구결과와 논의에 기초하여 청소년기에 도박을 예방할 수 있는 구체적 제언을 제시했다. This study was conducted with 13 study participants who had started gambling during adolescent years and became addicted in their adult years to examine what addiction process was gone through that onset of adolescent gambling became addicted and because of this what problems were caused. Data was composed of conducting in-depth interview and was analyzed by open coding, axial coding, selective coding in order, which is one of grounded theory methodology by Strauss and Corbin(1988). Results were as follows. 108 concepts from open-codings, 35 sub-categories, and 14 categories were composed. As for axial coding, 15 categories were proposed as a paradigm model. As for causal condition, ‘high accessibility’, ‘easy pass through gateway to gambling’, as for contextual condition, ‘deviant achievement desire’, ‘gambling preparation’, ‘distorted cognition’, ‘confusion by in-separation’, as for phenomenon, ‘gambling fantasy’, as for intervening condition, ‘live by tied with gambling loop’, ‘become legal age for gambling’, ‘lack of social ethical consciousness’, ‘counseling which is blocked against wall’, as for action/reaction strategies, ‘give up self-identity’, ‘prepare gambling money regardless of means’, and results ‘deviant life aimed at luck’, ‘living as a outsider’ were proposed and verbal statements were described. As core category in selective coding, ‘a life that is trapped in a gambling vicious circle which is tied with the gambler’s self’ was proposed. Detail suggestion about prevention from gambling during adolescence were discussed.